Download "ELECTRICITY DISTRIBUTION LICENCE: STANDARD CONDITIONS"
7 confidential information for the purposes of standard condition 39 (Restriction on Use of Certain Information and Independence of the Distribution Business) only, has the meaning given in that condition. 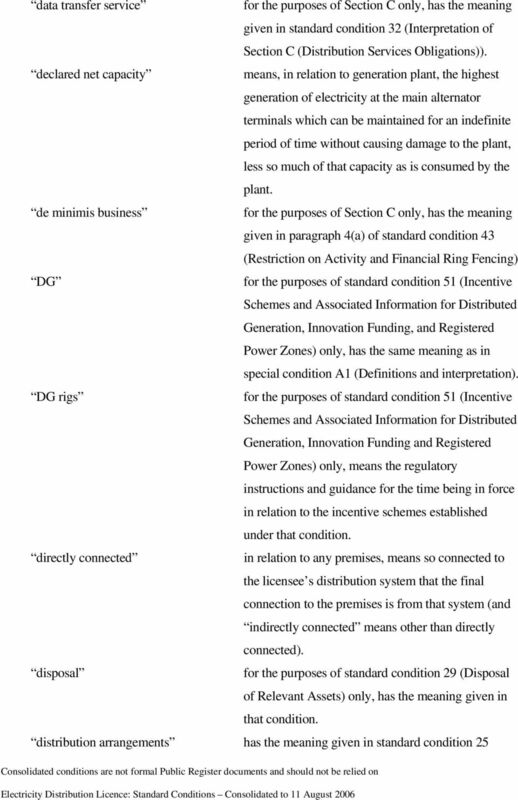 connection charges means charges made or levied, or to be made or levied, by the licensee for the provision of connections or the modification or retention of existing connections to the licensee s distribution system at entry or exit points, whether or not such charges or any part of them are annualised, and may include, as appropriate, costs relating to any of the matters that are mentioned in paragraph 5 of standard condition 4B (Connection Charging Methodology). 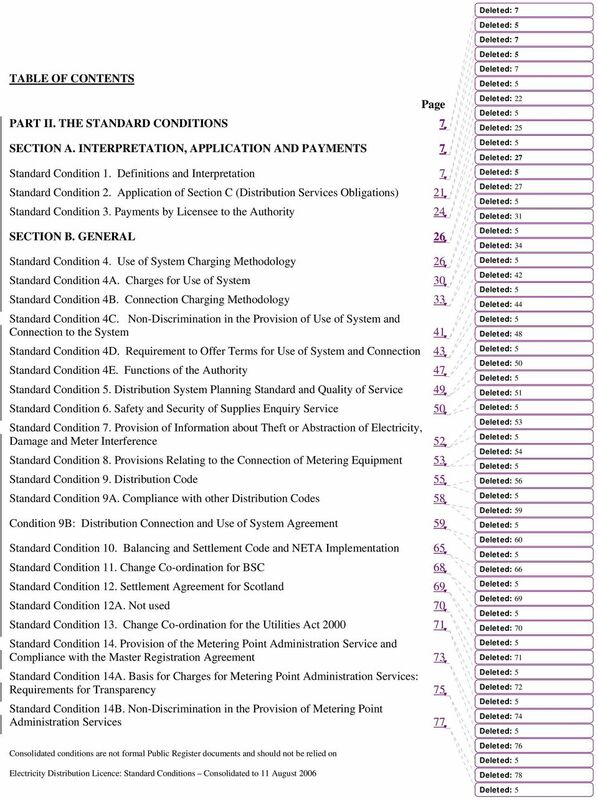 connection charging methodology means the principles on which and the methods by which, for the purposes of achieving the objectives referred to in paragraph 3 of standard condition 4B (Connection Charging Methodology), connection charges are determined. Consumer Council means the Gas and Electricity Consumer Council established under section 2 of the Utilities Act convenience customers means customers supplied or requiring to be supplied at any premises which are directly connected to the licensee s distribution system but are situated within the distribution services area of a distribution services provider other than the licensee. 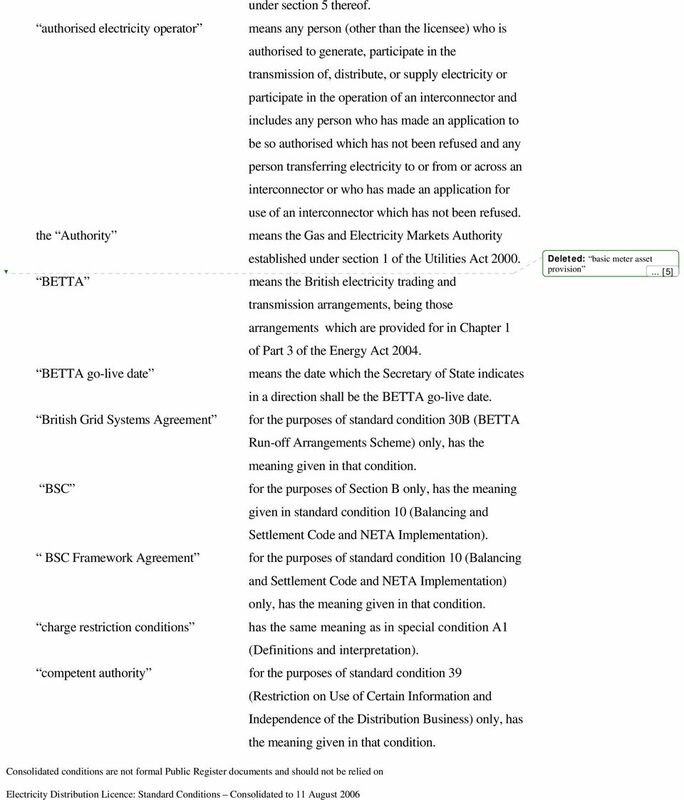 core industry documents for the purposes of standard conditions 10 (Balancing and Settlement Code and NETA Implementation) and 11 (Change Co-ordination for BSC) only, has the meaning given in standard condition 10; and for the purposes of standard condition 26 Compliance with CUSC) only, has the meaning given in that condition. 8 cross-default obligation for the purposes of standard condition 47 (Indebtedness) and standard condition BA6 (Indebtedness) only, has the meaning given in that condition. CUSC for the purposes of standard condition 26 (Compliance with CUSC) only, has the meaning given in that condition. CUSC Framework Agreement for the purposes of standard condition 26 (Compliance with CUSC) only, has the meaning given in that condition. customer for the purposes of standard condition 49 (Quality of Service Incentive Scheme and Associated Information) and special condition C2 (Calculation of the charge restriction adjustments arising from performance in respect of quality of service) only, has the meaning given in the quality of service rigs, otherwise, means any person supplied or requiring to be supplied with electricity at any premises in Great Britain, but does not include any authorised electricity operator in its capacity as such. data aggregation has the meaning given in standard condition 36A (Requirement to Offer Terms for the Provision of Data Services). data processing has the meaning given in standard condition 36A (Requirement to Offer Terms for the Provision of Data Services). data retrieval has the meaning given in standard condition 36A (Requirement to Offer Terms for the Provision of Data Services). 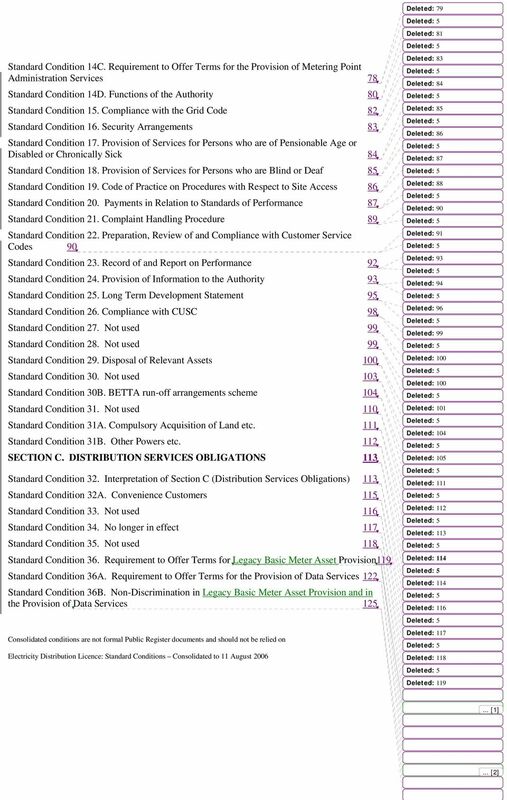 data services for the purposes of Section C only, has the meaning given in standard condition 36A (Requirement to Offer Terms for the Provision of Data Services). 11 a licensed distributor pursuant to standard condition 9 (Distribution Code) and approved by the Authority as revised from time to time with the approval of the Authority. distribution licence means a licence granted or treated as granted under section 6(1)(c) of the Act. distribution services means all services provided by the licensee as part of its distribution business other than excluded services. distribution services area has the meaning given at paragraph 5 of standard condition 2 (Application of Section C (Distribution Services Obligations)). Distribution Services Direction has the meaning given in standard condition 2 (Application of Section C (Distribution Services Obligations)). distribution services provider means a licensed distributor in whose licence Section C has effect. distribution system means the system consisting (wholly or mainly) of electric lines owned or operated by an authorised distributor and used for the distribution of electricity from grid supply points or generation sets or other entry points to the points of delivery to customers or authorised electricity operators or any transmission licensee within Great Britain in its capacity as operator of the licensee s transmission system or the GB transmission system, and includes any remote transmission assets (owned by a transmission licensee within England and Wales) operated by such distributor and any electrical plant, meters and metering equipment owned or operated by such distributor in connection with the distribution of electricity, but does not include any part of the GB transmission system. 15 metering equipment Metering Point Administration Service metering point administration services Metering Point Administration Service operator non-domestic customer non-gb trading and transmission arrangements other Distribution Codes Master Registration Agreement) and standard condition 37 (The Metering Point Administration Service and the Master Registration Agreement). includes any electricity meter and any associated equipment which materially affects the operation of that meter. means the service to be established, operated and maintained by the licensee in accordance with standard condition 14 (Provision of the Metering Point Administration Service and Compliance with the Master Registration Agreement). 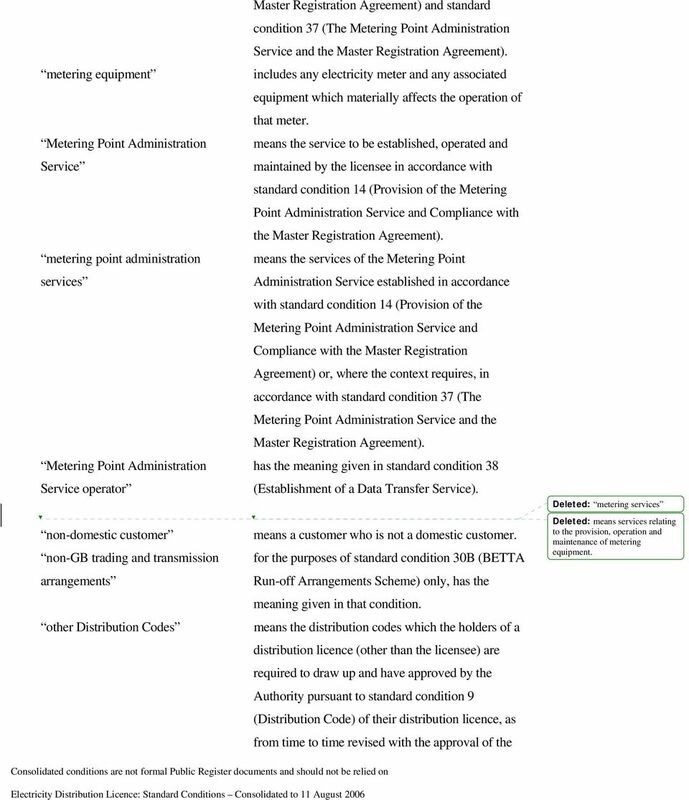 means the services of the Metering Point Administration Service established in accordance with standard condition 14 (Provision of the Metering Point Administration Service and Compliance with the Master Registration Agreement) or, where the context requires, in accordance with standard condition 37 (The Metering Point Administration Service and the Master Registration Agreement). has the meaning given in standard condition 38 (Establishment of a Data Transfer Service). means a customer who is not a domestic customer. for the purposes of standard condition 30B (BETTA Run-off Arrangements Scheme) only, has the meaning given in that condition. 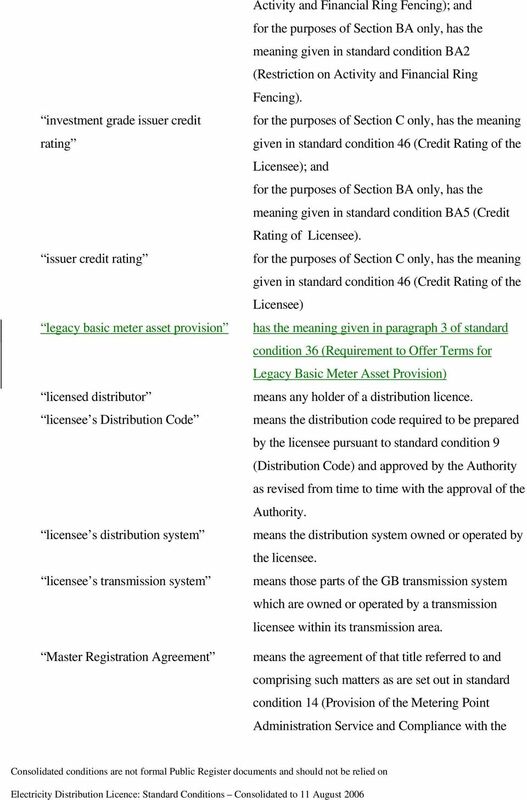 means the distribution codes which the holders of a distribution licence (other than the licensee) are required to draw up and have approved by the Authority pursuant to standard condition 9 (Distribution Code) of their distribution licence, as from time to time revised with the approval of the Deleted: metering services Deleted: means services relating to the provision, operation and maintenance of metering equipment. 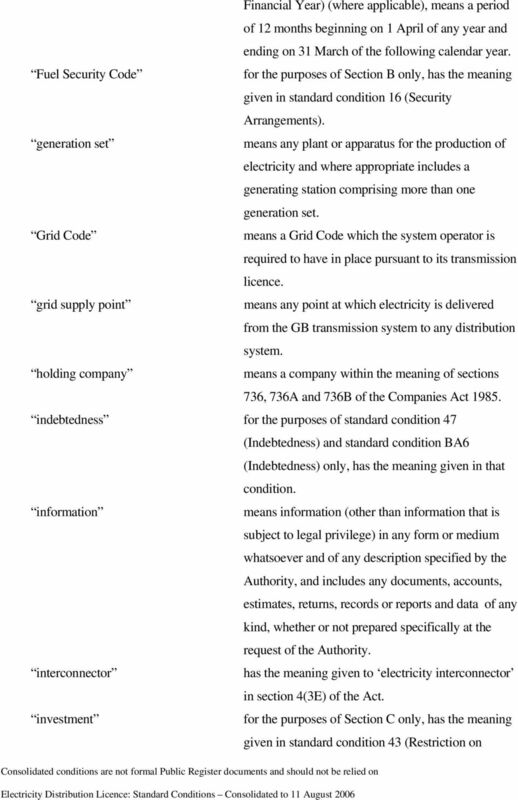 18 are embedded in the licensee s distribution system or the distribution system of any authorised distributor and are not directly connected by lines or plant owned by the owner transmission licensee to a sub-station owned by the owner transmission licensee; and are by agreement between the owner transmission licensee and the licensee or such authorised distributor operated under the direction and control of the licensee or such authorised distributor. revenue reporting rigs running-off Scottish Grid Code Secretary of State s costs Section C (system operator standard conditions) Direction for the purposes of standard condition 50 (Price Control Revenue Reporting and Associated Information) only, means the regulatory instructions and guidance for the time being in force under that condition. for the purposes of standard condition 30B (BETTA Run-off Arrangements Scheme) only, has the meaning given in that condition. means any grid code which any transmission licensee other than the system operator is obliged to maintain pursuant to its licence. for the purposes of standard condition 3 (Payments by Licensee to the Authority) only, has the meaning given in that condition. 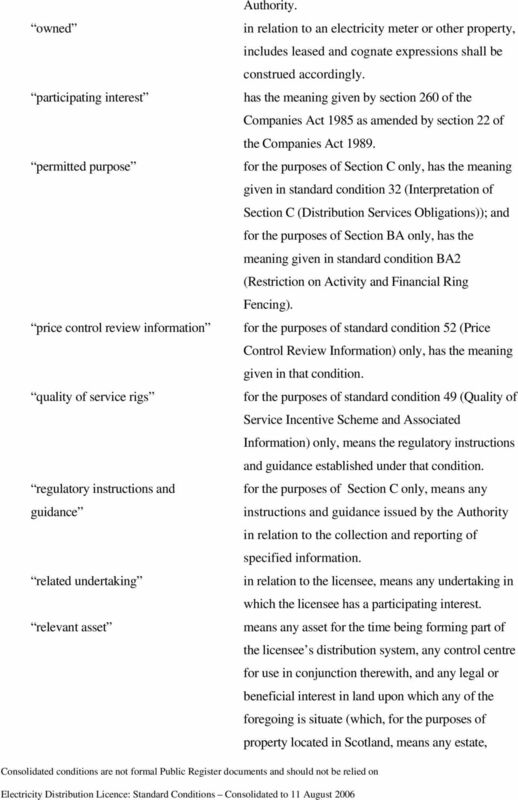 means a direction issued by the Authority or (where appropriate) the Secretary of State in accordance with standard condition A2 (Application of Section C) of the standard conditions for transmission licences. 22 use of system use of system charges use of system charging methodology measured by metering equipment. means use of the licensee s distribution system for the distribution of electricity by the licensee on behalf of any person. 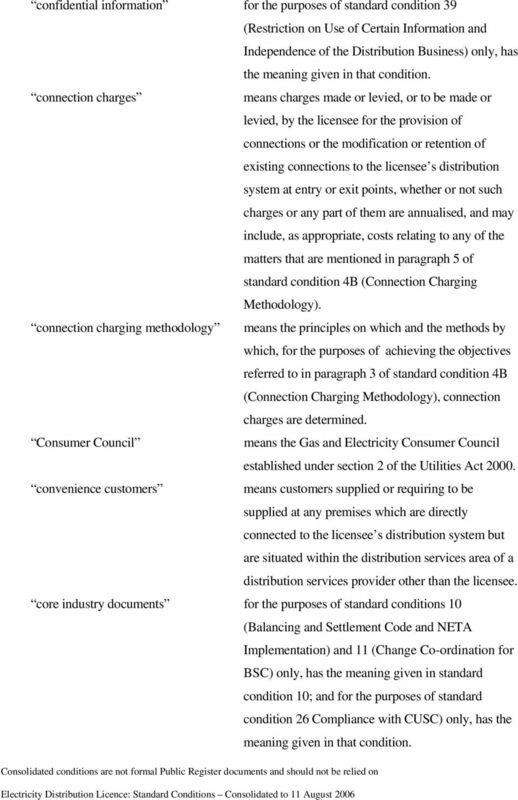 means charges made or levied, or to be made or levied, by the licensee for the provision of services as part of the distribution business to any person, all as more fully described in standard conditions 4 (Use of System Charging Methodology) and 4A (Charges for Use of System), but does not include connection charges. means the principles on which and the methods by which, for the purposes of achieving the objectives referred to in paragraph 3 of standard condition 4 (Use of System Charging Methodology), use of system charges are determined. 2. 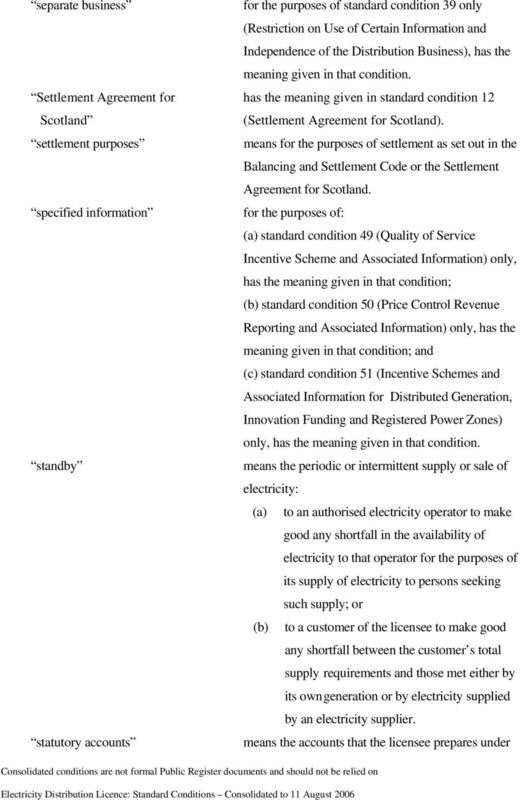 Any words or expressions used in Part 1 of the Act, the Utilities Act 2000 or the Energy Act 2004 shall, unless the contrary intention appears, have the same meanings when used in the standard conditions. 3. Except where the context otherwise requires, any reference to a numbered standard condition (with or without a letter) or schedule is a reference to the standard condition (with or without a letter) or schedule bearing that number in this licence, and any reference to a numbered paragraph (with or without a letter) is a reference to the paragraph bearing that number in the standard condition or schedule in which the reference occurs, and any reference to a section is a reference to that section in these standard conditions. 4. These standard conditions shall have effect as if, in relation to a licence holder who is a natural person, for the words it, its and which there were substituted the words he, him, his, who and whom, and cognate expressions shall be construed accordingly. 24 the original instrument or other confirmation in writing shall be delivered or sent by pre-paid first-class post as soon as is reasonably practicable; and where the means of transmission had been agreed in advance between the parties concerned, in the absence of and pending such confirmation, there shall be a rebuttable presumption that what was received duly represented the original instrument. 11. 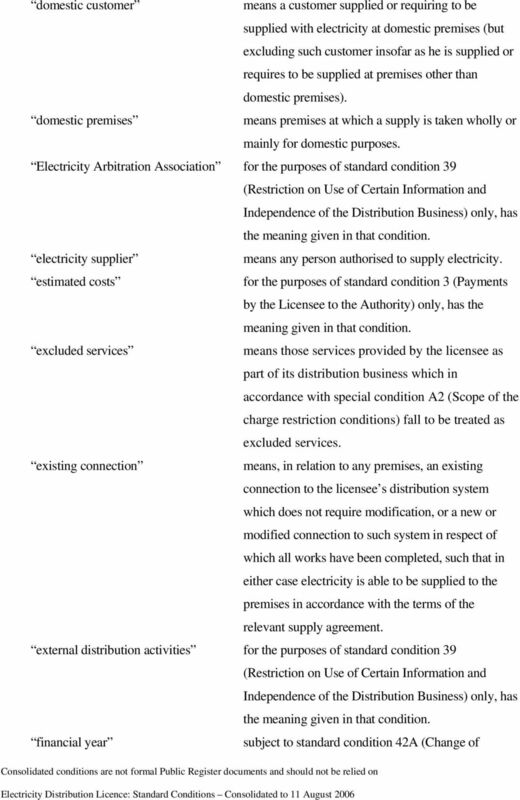 The definitions set out in this condition may include some definitions which are not used or not used exclusively in sections A and B (which sections are incorporated in all distribution licences). 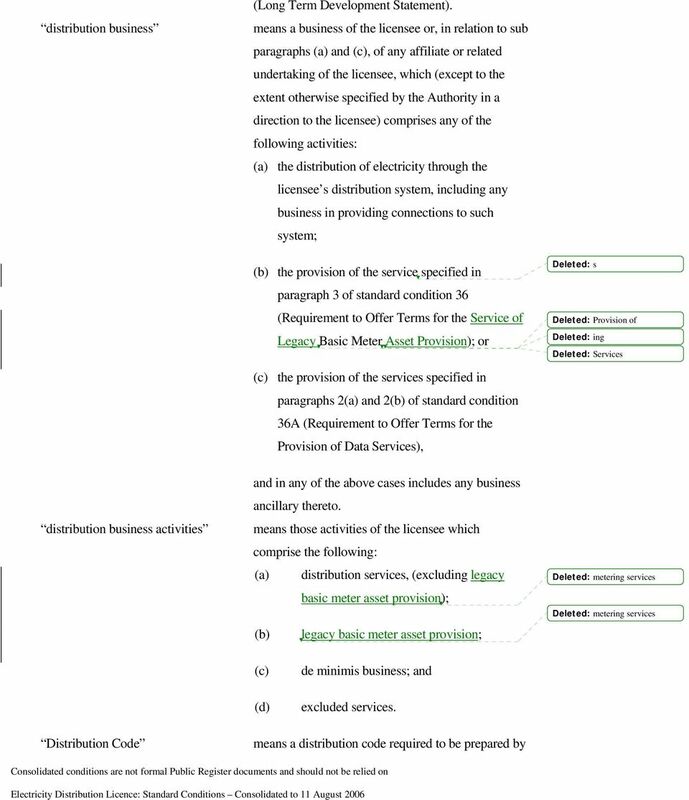 Accordingly: where any definition is not used in sections A and B, that definition shall, for the purposes of this licence, be treated: (i) as part of the standard condition or conditions (and the section) in which it is used; and (ii) as not having effect in the licence until such time as the standard condition in which the definition is used has effect within the licence in pursuance of standard condition 2 (Application of Section C (Distribution Services Obligations)); and: where any definition which is used in sections A and B is also used in one or more other sections: (i) that definition shall only be modifiable in accordance with the modification process applicable to each of the standard conditions in which it is used; and (ii) if any such standard condition is modified so as to omit that definition, then the reference to that definition in this condition shall automatically cease to have effect. 26 suspension and providing for those paragraphs to have effect in this licence with effect from the date specified in the notice. 4. The Authority may, with the consent of the licensee, issue a direction (a Distribution Services Direction ). 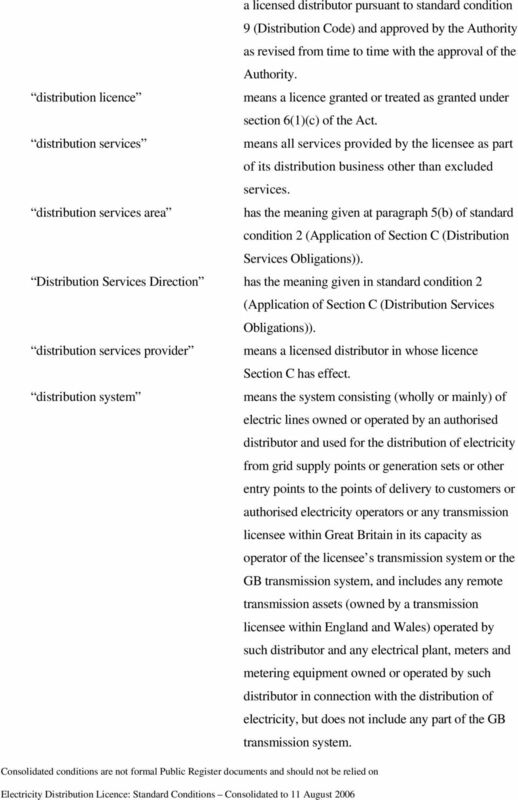 Where the Authority has issued to the licensee a Distribution Services Direction the standard conditions in Section C (in whole or, as the case may be, in part) shall have effect within this licence from the date specified in the direction; and the licensee shall be obliged to comply with the requirements of Section C (in whole or, as the case may be, in part) to the extent and subject to the terms specified in such direction. 5. 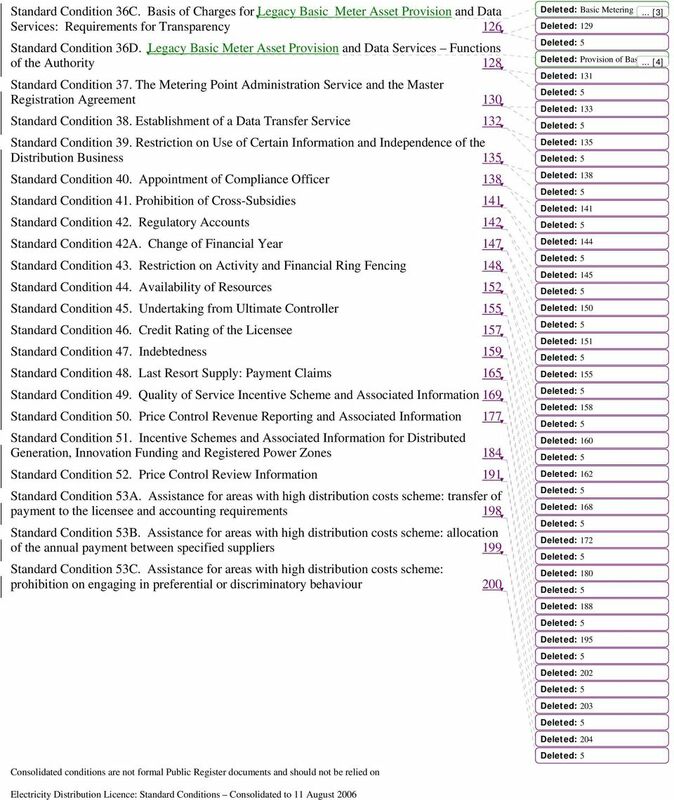 A Distribution Services Direction: may specify that the standard conditions in Section C (in whole or in part) are to have effect in this licence; shall specify or describe an area (the distribution services area ) within which the licensee shall be obliged to comply with any of the requirements of Section C (in whole or, as the case may be, in part); and (c) shall specify whether or not the requirements of Section C (in whole or, as the case may be, in part) apply to convenience customers. 6. 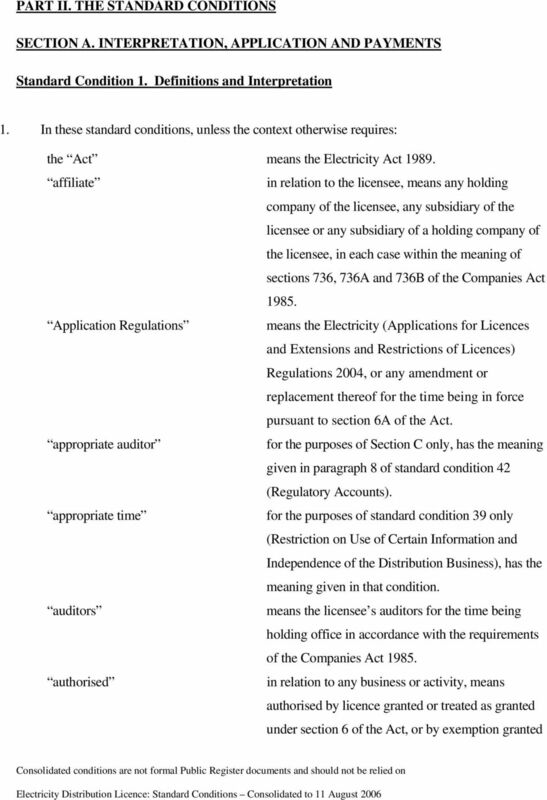 The Authority may, with the consent of the licensee: vary the terms (as set out in the Distribution Services Direction or elsewhere) under which Section C (or parts thereof) has effect in this licence; or provide for Section C (or parts thereof) to cease to have effect in this licence. 7. The variation or cessation provided for in paragraph 6 shall take effect from the date specified in the variation or cessation notice given to the licensee by the Authority. 27 8. With effect from the date of cessation referred to in paragraph 7, paragraphs 4 to 7 of this condition shall be suspended and shall cease to have effect in this licence, but the Authority may at any time thereafter, with the consent of the licensee, give to the licensee a notice ending the suspension and providing for those paragraphs to have effect again in this licence with effect from the date specified in the notice. 29 shall with effect from that payment date pay simple interest on that amount at the rate which is from time to time equivalent to the base rate of NatWest Bank plc or, if there is no such base rate, such base rate as the Authority may designate for the purposes hereof. 5. In this condition: estimated costs means costs estimated by the Authority as likely to be or have been: the costs of (i) the Authority calculated in accordance with principles determined by the Authority for the purposes of this condition generally (after consultation with the licensee and others likely to be affected by the application of such principles) and notified to the licensee; and (ii) the Consumer Council; and the costs incurred by the Competition Commission in connection with references to it in respect of this licence or any other licence granted under the Act or the Gas Act 1986, such estimate having regard to any views of the Competition Commission; relevant proportion relevant year means the proportion of the costs attributable to the licensee in accordance with principles determined by the Authority for the purposes of this condition generally (after consultation with the licensee and others likely to be affected by the application of those principles) and notified to the licensee or, in relation to the costs of the Competition Commission, in accordance with any direction given by the Competition Commission under section 177(3) of the Energy Act 2004 or, in the absence of such direction, in accordance with such principles; and means a year beginning on 1 April of each calendar year and ending on 31 March of the following calendar year. 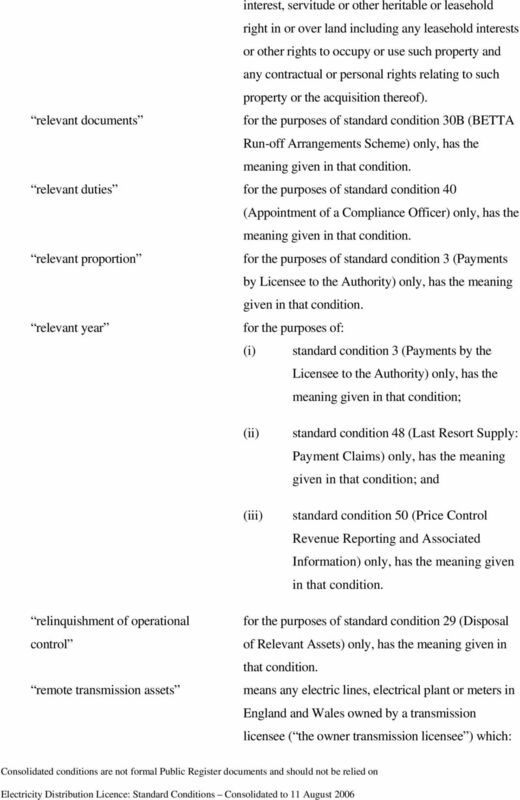 Landlord and Tenant (Covenants) Act 1995 CHAPTER 30 ARRANGEMENT OF SECTIONS Section 1. 2. Preliminary Tenancies to which the Act applies. Covenants to which the Act applies. Transmission of covenants 3. 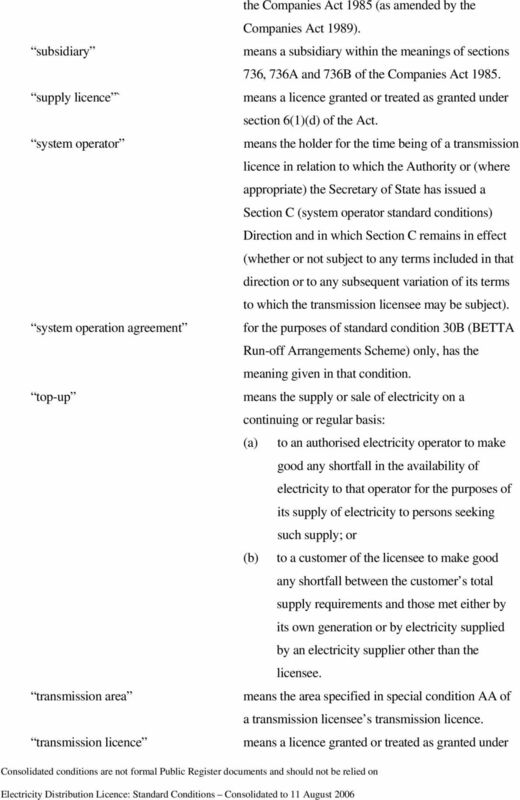 Wales Bill EXPLANATORY NOTES. 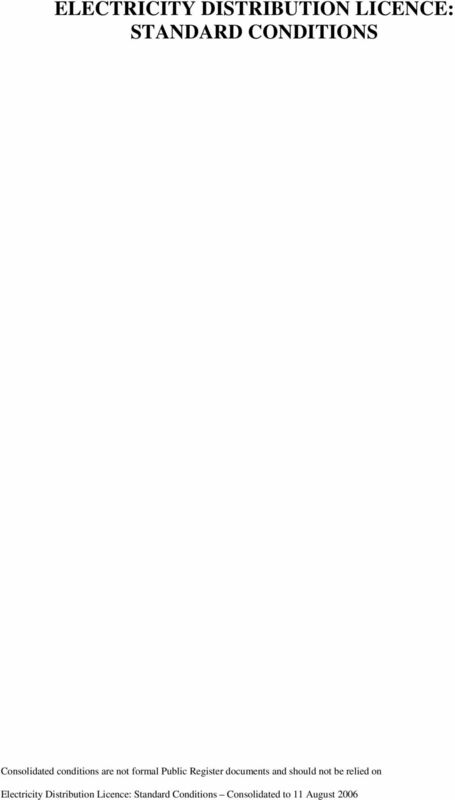 Explanatory notes to the Bill, prepared by the Wales Office, are published separately as Bill 5 EN.